Discovered in the 1980’s; a local farmer was walking his land searching for palm leaf to cut for roofing. His dog chased some game into what appeared to be a burrow. When the dog did not come back out the hunter investigated and found that the opening was a rock filled entrance to a cave. He found a huge cave filled with Mayan ceremonial pottery and a deep ceremonial chamber that extends one-half mile into the earth. He is still the one who guides you through the cave! 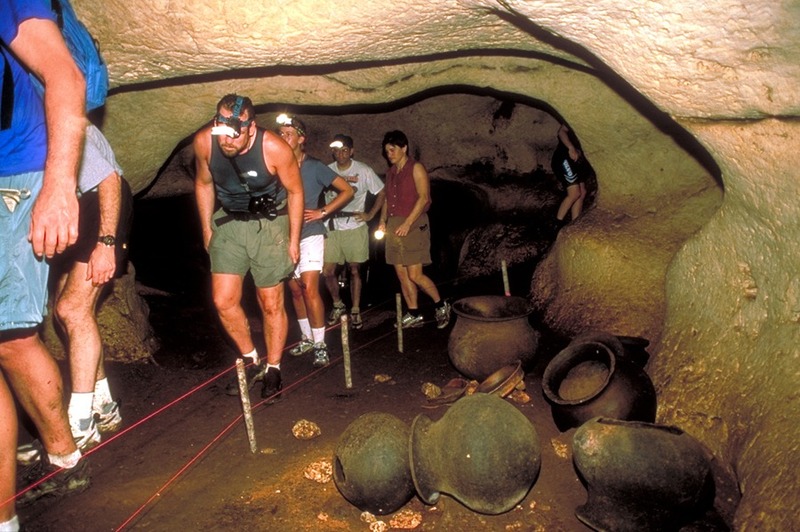 Considered the premier Belize cave, Actun Tunichil Muknal (ATM) has been featured in magazine articles and on television. Located in the jungle near the town of Teakettle Bank, you swim to enter the cave via a small creek. Inside the cave lies an amazing collection of ceramic pottery and ceremonial sites, along with huge dripstone formations. 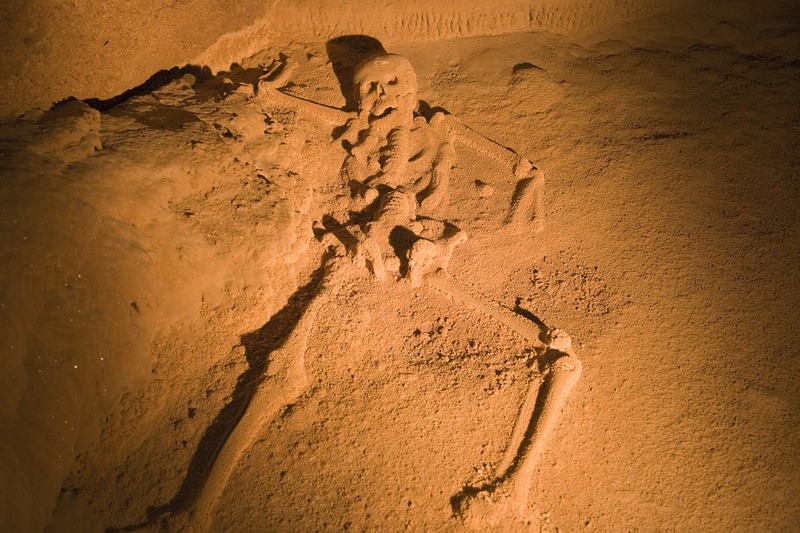 The main feature is a complete skeleton of a young woman which has been encrusted with crystals and bonded to the floor of the cave. The best place to access ATM is from Pook’s Hill Lodge, which is almost “next door”. To located Pook’s Hill Lodge, visit our map of Belize lodges. If you want to do more than just one cave tour while in Belize, you will want to stay at the Caves Branch Jungle Lodge. This is where caving exploration began in Belize, way back in the early 80s. 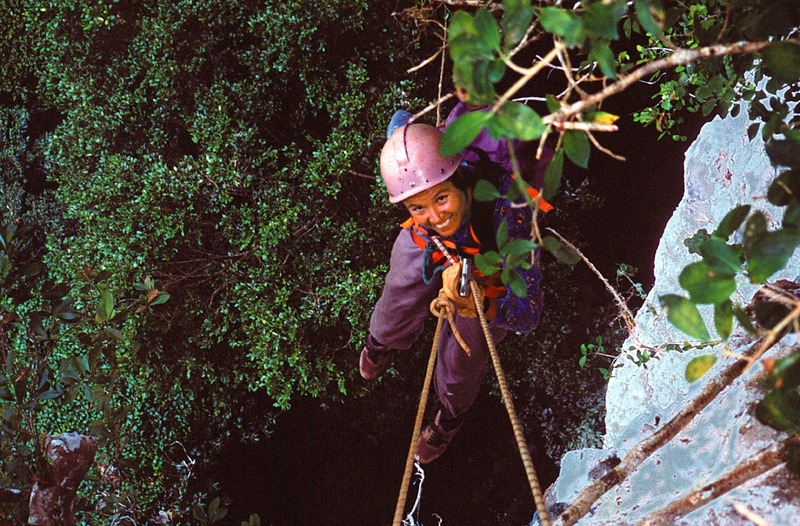 With well-trained guides and an emphasis on safety and exploration, this is the place to go for caving enthusiasts. They can take you to the Black Hole Drop (pictured at right), the Waterfall Cave, Footprint Cave, and The Lost World to name a few. Some of the tours require you to be in good physical shape, so do inquire about the fitness level required for each tour. Read more about these and other Belize caves. 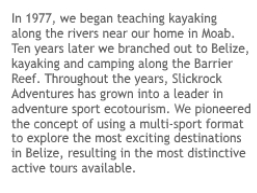 If you think you would prefer kayaking in caves, join Belize Adventure Week, offered by Slickrock Adventures.